Once upon a time, in mining town in Pennsylvania called Harmony, there was this handsome but totally deranged young man named Tom Hanniger (Jensen Ackles) who took on the personality of Harry Warden a dead miner who used to kill people with a pick axe. Hanniger unable to control his split personality, began taking up where Warden left off and..oh wait wrong My Bloody Valentine! 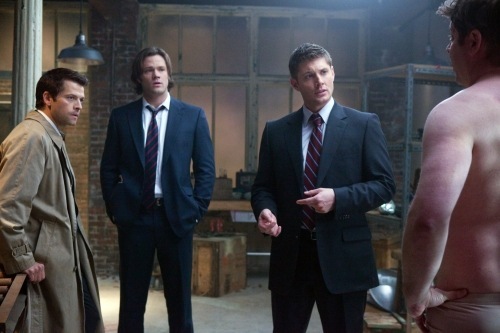 This one is the newest episode of season five of the hit CW Network series, Supernatural. While this aptly titled 14th episode of Supernatural, which is being aired in February (and you gotta love this show’s sense of the absurd to connect these things together) might not be featured in the latest 3D technology, we still get to see Jensen Ackles..and Jared Padalecki too. In Supernatural S5.14, My Bloody Valentine (directed by Mike Rohl and written by Ben Edlund), Castiel (Misha Collins) helps Sam (Jared Padalecki) and Dean (Jensen Ackles) hunt down Cupid (guest star Lex Medlin) on Valentine’s Day after townspeople start to kill each other for love. However, after Cupid tells them he’s innocent, they discover Famine (guest star James Otis), one of the Four Horsemen of the Apocalypse, has arrived in town. Hmmm, wonder if he is as good looking as the deranged killer, Tom Hanniger? Let’s take a look at the sneak peeks provided by Warner Brother and see if we get to find that out. TELEVISION: Cupid: The God of Love Is In The House! Cupid [ABC, Tuesdays, 10/9C] has an odd history. Rob Thomas [Veronica Mars] had this prematurely cancelled series in 1998 about an exiled God of Love who was exiled to Earth until he could match one hundred couples – true love, mind you. Then, and only then, would he be allowed to return to Mount Olympus. The series was smart, witty, funny, and almost desperately romantic and quite possibly the best show of the year in the minds of many critics. It also put Jeremy Piven on the road to something akin to stardom. It lasted fifteen episodes. Ever since, Cupid fans have been clamouring for it’s release on DVD. Now, ABC and Mr. Thomas have resurrected the series and the good news is that it’s very good. The set up is virtually identical: Cupid [Bobby Cannavale]is the love god who is exiled to Earth for his arrogance, and charged with matching one hundred couples – without the aid of magic – before he will be allowed to return home. As in the original, he is thought to be crazy [though there are brief moments that give the audience clues that he isn’t] and only released into the world under the supervision of psychologist Dr. Claire Allen [Sarah Paulson]. Dr. Allen specializes in love, too, but love built on a foundation of sensible and logical steps. She and Cupid – now going by Trevor Pierce – are at extreme ends of the spectrum in their beliefs and approaches to the subject. His first attempt is to help an Irish troubadour find the woman with whom he had a “transcendent moment” on her last day in Ireland. In the process of helping Dave [Sean McGuire], Trevor enlists the aid of a reporter named Madeline [Marguerite Moreau] – who falls in love with Dave! The premiere episode of Cupid is almost as smart, witty, funny and romantic as the original, if a little less brash and little more dramatic. The interplay between Trevor and Claire is saucy and clever; the two are very much a match for each other in intelligence and wit. The supporting characters – Felix [Rick Gomez] and Lita [Camille Guaty] – are an improvement over their original series counterparts. Felix is the guy who takes in strays – which means he hires Trevor to work at his bar and gives him a place to live. Lita thinks Felix is crazy [there’s that word, again] for doing so. The direction is precisely what the show needs – the pacing is up-tempo, but not too much to make it jarring when a shot requires a bit of lingering, but never holding onto a shot for too many beats. The entire production is good enough that I will be very disappointed if Cupid is, once again, too hip for the room. Really, the original show was ten years ahead of its time, stylistically and content-wise – which means we should be ready for it, now. And maybe, just maybe, we can get that DVD set of the original series. For the fall season, ABC greenlighted only a handful of new shows: the drama Life on Mars [based on the British, series of the same name]; comedies Scrubs [moving from NBC] and The Goode Family; and two alternative [reality] shows, the Untitlted Ashton Kutcher/Tyra Banks and Opportunity Knocks. “Castle” is a comedic crime procedural about a famous mystery novelist, Nick Castle, who is bored with his own success. When a real-world copycat murderer starts staging scenes from Nick’s novels, Nick is teamed up with NYPD Detective Kate Beckett and the challenge gets his blood pumping as he steps in to help solve the crime. Nick and Beckett’s styles instantly clash and sparks begin to fly, leading both to danger and a hint of romance. Nick is kept grounded by his Broadway diva mother, quick-witted teenage daughter and his long-suffering ex-wife… who happens to be his editor. “Castle” stars Nathan Fillion as Castle, Stana Katic as Beckett, Molly Quinn as Alexis, Susan Sullivan as Martha, Monet Mazur as Gina and Ruben Santiago-Hudson as Capt. Montgomery. “Cupid” is a romantic dramedy about Trevor, a larger than life character who may or may not be the Roman god of love, Cupid, sent to earth to bring couples together. As fate would have it, Trevor is under the care of famous psychologist and self-help author Dr. Claire Allen, who is also dedicated to helping lonely hearts find their soul mates. While she agrees with his cause, she questions whether he’s crazy or really is Cupid. “Cupid” stars Bobby Cannavale as Trevor, Sarah Paulson as Claire, Rick Gomez as Felix and Camille Guaty as Lita. “The Unusuals” is a unique comedic procedural set in a New York police precinct. As a cop, it helps to have a twisted sense of humor, because every moment could be your last. Just ask Casey Schraeger, who started her day as an NYPD vice detective before unexpectedly being transferred to the homicide division. She quickly realizes that, not only does everyone in her new department have a distinct sense of humor, but also their own dirty little secrets. “The Unusuals” stars Amber Tamblyn as Det. Casey Schraeger, Jeremy Renner as Det. Joe Walsh, Terry Kinney as Sgt. Harvey Brown, Kai Lennox as Det. Ed Alvarez, Harold Perrineau as Det. Leo Banks, Adam Goldberg as Det. Eric Delahoy, Monique Gabriela Curnen as Det. Allison Beaumont and Joshua Close as Henry Cole. “Better Off Ted” is a satirical office comedy featuring a successful but morally conscious man, Ted, who runs a research and development department at a morally questionable corporation, Veridian Technologies. No achievement is too far fetched and no invention too unorthodox for Veridian. Need a suicidal turkey? Done. Need a metal that is hard as steel but bounces – and is edible? Done and done. Ted loves his seemingly perfect job; he loves his superhuman boss, Veronica, and colleagues Lem, Phil and Linda, but he’s starting to take a closer look at the company’s extremely questionable practices… especially when they try to cryogenically freeze one of Ted’s scientists for testing purposes. Starring Jay Harrington as Ted, Andrea Anders as Linda, Portia de Rossi as Veronica, Jonathan Slavin as Phil and Malcolm Barrett as Lem,. “Single with Parents” is a comedy about Lou, a woman in her mid-30s who is determined to have her own life despite her crazy blended family getting in the way. She’s thrilled that her divorced parents are leading exciting lives – really she is – except both of them rely on her way too much. Dad needs her as a surrogate parent and Mom counts on her 24/7 as a shrink and confidante. Lou has resolved to finally find a fulfilling life for herself. The series stars Alyssa Milano as Lou, Annie Potts as Elizabeth, Beau Bridges as Joe, Amanda Detmer as Sasha, Meagen Fay as Nancy and Eric Winter as Charlie.